The availability of cheap WiFi boards like the ESP8266 and others means you can inexpensively put projects on the network. But there is still the problem of how to connect these devices to other places reliably. An Open Source project that attempts to make that whole effort point and click is Mongoose OS. The open source system works with the ESP8266, ESP32, and several other platforms. It is well integrated with Amazon’s IoT backend, but it isn’t locked to it. Everyone wants to be your IoT broker and we see products appear (and disappear) regularly aimed at capturing that market. One common way to send and receive messages from a tiny device to a remote server is MQTT, an ISO standard made with resource-limited devices in mind. Many IoT services speak this protocol, including Amazon’s IoT offering. You can see how quick it is to flash an ESP8266 to make an Amazon IoT button in the video below. Although the video example uses Amazon, you can configure the system to talk to any public or private MQTT broker. [Jeff Rodriguez] has been busy testing a feasible DIY method for rifling a barrel and has found some success using salt water, a power supply, wire, and 3D printed parts to create the grooves of rifling without the need for any moving parts or cutting tools. Salt water flows between the barrel’s inside surface and a 3D-printed piece that holds wires in a precise pattern. A current flows between the barrel and the wires (which do not actually touch the inside of the barrel) and material is eroded away as a result. 10-15 minutes later there are some promising looking grooves in the test piece thanks to his DIY process. Rifled barrels have been common since at least the 19th century (although it was certainly an intensive process) and it still remains a job best left to industrial settings; anyone who needs a barrel today normally just purchases a rifled barrel blank from a manufacturer. No one makes their own unless they want to for some reason, but that’s exactly where [Jeff] is coming from. The process looks messy, but [Jeff] has had a lot of space to experiment with a variety of different methods to get different results. If you’ve ever spent any time around a lab, you’ve doubtless seen one of those awesome combination magnetic stirrer and heater plates that scientists use to get liquids mixed and up to temperature. If you’ve ever etched your own PCBs using ammonium persulfate, you’ve experienced the need for both heating and agitation firsthand. Using a stirrer plate for PCB etching is putting two and two together and coming up with four. Which is to say, it’s a good idea that’s not amazingly novel. [acidbourbon] built his own, though, and there’s almost no part of this DIY heater/stirrer that isn’t a hack of some kind or another. Start off with the temperature controller. Instead of buying a thermocouple or using an LM75 or similar temperature-measurement IC, [acidbourbon] uses a bog-standard 1n4148 diode. The current passed through a diode, at a given voltage, is temperature dependent, which means that adding a resistor and a microcontroller’s ADC yields a quick hacked temperature sensor. [acidbourbon] glued his straight onto the casserole that he uses as an etching tray. Does the type of person who saves $0.25 by using a diode instead of a temperature sensor go out and buy a stirrer motor? No way. Motor and gears come from a CD-ROM drive. The “fish” — the magnetic bar that spins in the etchant — is made of neodymium magnets lengthened by shrink-wrapping heat-shrinking them together with some capacitors. Who knew that shrinkwrap heat-shrink, fused with pliers, was waterproof? Is that a wall-wart in that box, with the prongs wired to mains electricity? 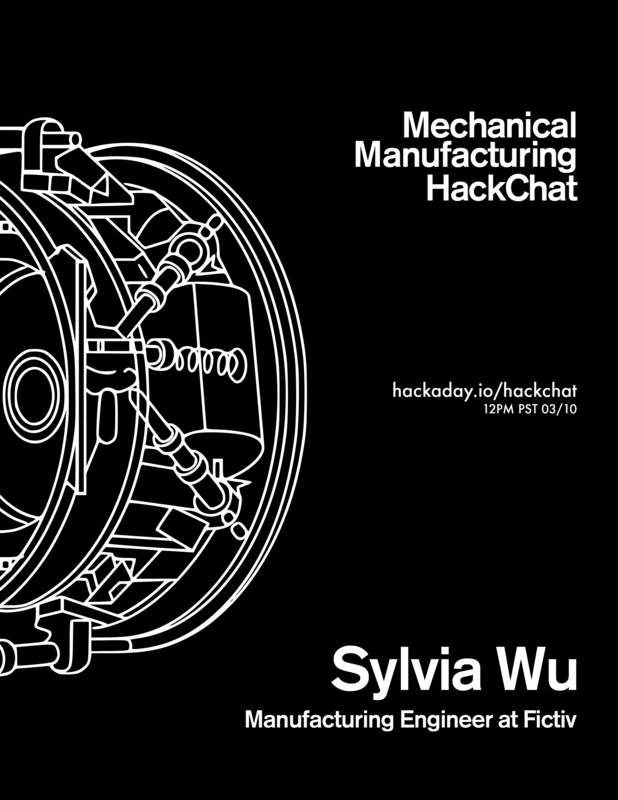 Join [Sylvia Wu], a Senior Manufacturing Engineer at Fictiv, for this week’s Hack Chat. [Sylvia’s] work at Fictiv gives her a unique viewpoint for modern manufacturing. The company connects engineers with rapid manufacturing by taking in a design and routing it to a shop that has the tools and time to fabricate the part quickly. This means seeing the same silly mistakes over and over again, but also catching the coolest new tricks as they pass by. She also spends time tearing apart consumer products to see how they have been manufactured, adding to their arsenal of available processes, both time-tested and newfangled. On Friday March 17th the Hack Chat features chip design for oscilloscopes with engineers from Keysight.